Netgear is moving from the computer room to the front room with the NeoTV Prime with Google TV, its all-in-one media streamer announced at CES 2013. 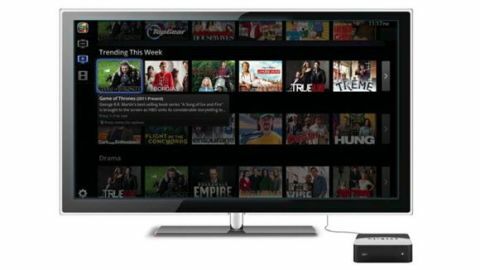 The company, primarily known for wireless routers, worked closely with Google to bring just about every possible mainstream app to its 1080p HD set-top box powered by Android Honeycomb. All of the usual suspects are here: Netflix, Hulu Plus, Vudu, Pandora, YouTube, HBO Go, Crackle, and Amazon Instant Video. But it's the rarer features like the Google Play store, Slingplayer app, and the ability to co-op a cable box's live TV signal that sets the NeoTV Prime apart from its media streaming competition. The Google Play store has thousands of apps and now offers movies, TV shows and songs. But you aren't limited to downloading from Google Play. The Google TV search function plays nicely with others by listing all of the places where you can buy or rent digital content. If you want to purchase The Hangover and it happens to be cheaper on Amazon Instant Video, this box is going to let you know. Yes, the NeoTV actually saves you money, while Google loses money. The Google TV PrimeTime feature will save you time, too. Sort of like Netflix's suggestions based on viewing habits, Google TV takes into account your live TV, app, and web preferences to learn and recommend movies and shows that are right for you. To top it off, it comes with a full Chrome browser that supports Flash and HTML5. The integration of Adobe's sometimes-outcast software is important because it's still widely used on the web, and also because owners of this Google TV device can stick it to their Apple TV-owning friends. You can rent and buy content outside of the Google Play store. One of the downsides to cutting the cable TV cord or adding yet another set-top box to your home is that you complicate watching live TV. Switching back and forth between a DVR and a media streamer has never been fun, even with the best HDMI switch box. The Netgear NeoTV Prime solves that problem by including an HDMI input as well as an output. This extra port, uncommon among set-top boxes, allows the Google TV device to act as a passthrough box. Now all it takes to control TV channels is plugging a satellite or cable box's HDMI cable into the HDMI input, and utilizing the pair of IR blasters that come with the NeoTV Prime. The Slingplayer app also helps travelers and cord-cutters retain live television. It acts as an alternative to the SlingCatcher, a discontinued product. Netgear's NeoTV line is one of two set-top box devices on the market (the Boxee Box is the other) to have this invaluable Slingplayer app. Like the app-filled NeoTV Prime box, its remote control has just about all of your bases covered. A touchpad sits at the top of the remote's front side for all of the times you wish your set-top box had a mouse for the browser. Below of the touchpad are more typical buttons for DVR playback and changing the volume and channels. You can also instantly navigate to your favorite apps thanks to a wide range of labels start buttons at the very bottom. There are shortcuts to Netflix, Amazon Instant Video, YouTube, HBO Go, Crackle and My Media. Searching for content within these apps and inputting text into the Chrome browser is handled by a QWERTY keyboard on the back side. The remote's box shape design is a little uninspiring and, unfortunately, nothing on the remote is backlit. This can complicate life when you've already dimmed the house lights and attempt to type the name of a movie into the search bar. The NeoTV Prime remote isn't beautiful, but it has a lot of smart features if you prefer brains over beauty. It'd be easy to mix up the Netgear NeoTV Prime with its all-in-one streaming device competition. It comes with a lot of the same apps as the Apple TV, Roku 2 XS, and Boxee Box, and it's a similar discrete 4.7 inches by 4.1 inches by 1.5 inches. The biggest differences are inside this polished black box. The addition of Google TV PrimeTime, Google Search, the Slingplayer app and live TV give the NeoTV Prime a slick interface. Its integration with Android devices makes the NeoTV Prime even more convenient if you own a Google-powered smartphone or tablet. These extra features come at a slight premium, though. The NeoTV Prime with Google TV costs $129.99 in the U.S., around $30 more than the competition. Then again, you may be able to make up that amount over time, as Google suggests the cheapest alternatives to downloading movies and TV shows instead of funneling you to a store like iTunes. The Google TV integration makes the NeoTV Prime the best media streaming option from Netgear, and the best among its many rivals. Its slick user interface, live TV integration, Slingplayer app, and superior remote make it the app-filled media box to beat in 2013.